SIDNEY, Iowa – One by one, Chuck Swisher watched the three other bullfighters go during the championship round of the Bullfighters Only stop at Sidney Iowa’s Championship Rodeo on Saturday night. He paid close attention to every move, every counter move and every score. As the last man to challenge his animal, Swisher knew exactly what he needed to do. “Thankfully I drew a good bull from Hookin A Ranch,” he said. “I actually won the bullfighting in Burlington (Colo.) on him last year. The fight started bright for the Oklahoma man, who jumped the bull as it burst out of the chute. He made a couple of rounds, then took the bull toward the fence to work some fakes in small spaces. As the two separated, Swisher re-engaged with the animal, threw a fake a little early and was knocked down. “It doesn’t matter how hard you throw a fake, if you throw it too early, it’s not going to work,” he said. “He got under my vest and knocked the air out of me pretty good. I knew that if I didn’t act hurt, I wouldn’t be hurt, so I just went straight back to the fight. It was a busy week in southwest Iowa. Since competitor Evan Allard also served as a protection bullfighter during the rodeo and provided the fighting bulls, all nine men who were part of the Bullfighters Only competition pitched in to make sure everything was covered: feeding the bulls and sorting them for each night’s contest. “It seemed like I was busy all week,” said Swisher of Dover, Okla. “We wanted it to go as smooth as possible, so during the rodeo, I was in the back pens loading and flanking bulls. We all wanted it to be set up since Evan was working the rodeo. With his victory, Swisher earned just less than $3,000 and moved up two spots to eighth in the Bullfighters Only standings. “Any win is a great win, but during the BFO tour, you need to capitalize on it when you can,” he said. “Nate (Jestes) and Weston (Rutkowski) have about $13,000 on me, so I just need to get the ball rolling with some more wins. It’s a great starting point for me in Sidney, and I just want to keep rolling with it. 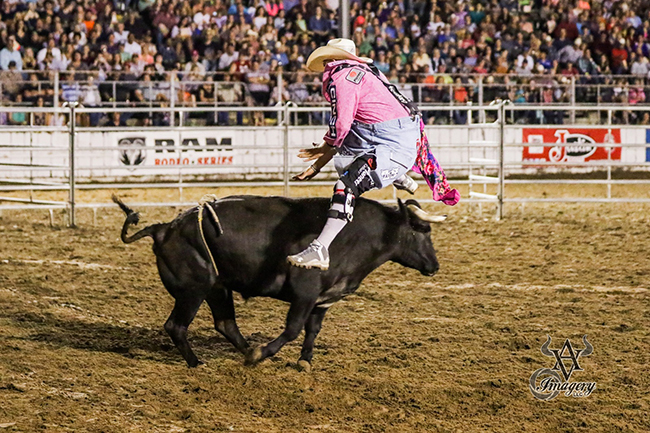 The Sidney stop featured three go-rounds with three bullfighters each night. The round winners advanced to Saturday’s short round, while the three men who were runners-up advanced to Friday’s wild card round. Cody Webster of Wayne, Okla., won on opening night, Swisher the second round and Ross Hill of Muscle Shoals, Ala., earned the third-round victory. Beau Schueth of O’Neill, Neb., earned his spot in the championship round by winning Friday’s bullfight, and the final night of the tour stop was done before a packed crowd at the rodeo that was inducted into the ProRodeo Hall of Fame just one year earlier. It definitely worked out that way for Swisher.